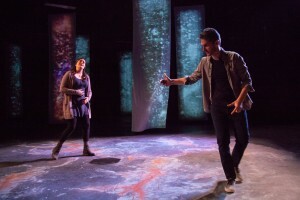 Rachel Dulude and Josh Short in Constellations at Wilbury Group. A fundamental but strange and counter-intuitive idea of quantum mechanics is that all possible states are in superposition together until resolved by observation. A quantum bit, or “qubit,” in a quantum computer is both 0 and 1 until observed, at which time it resolves to one state or the other. A cat inside a box is both dead and alive until someone opens the lid, at which time it resolves to one state or the other. At each moment in time, all of the possible paths forward can be regarded as superposed together in an infinite “multiverse” of universes, and we as residents of one particular universe can observe only our own, with no knowledge of or visibility into the others. To us, and to the denizens of each universe, the path we have traveled seems, looking backward, to have been inevitable. But what happens if we could see those others? The brilliant conceit of Constellations by Nick Payne is to make a selection of disjoint universes from the multiverse visible through the art of theater. What if that person we met at a cookout involved nothing more than sharing a hot dog and exchanging names, but we never saw them again? What if that person we met at a cookout became a romantic partner and we married? It is the theatrical version of painterly Cubism, where we get to see all of the sides of something simultaneously so that it looks nothing like what it seems to the casual observer. Two characters, Marianne (Rachel Dulude) and Roland (Josh Short), meet at a cookout and we see a number of possibilities from that meeting: they barely notice each other and part company, they chat but never see each other again, they remember each other and meet again later, they get into a romantic relationship and marry. We see some of these timelines progress, each with its own myriad forks of possibilities. Both Dulude and Short are called upon to give virtuoso acting performances, playing the same action over and over again until the instant when one universe branches off from another we have previously seen. The point of the play, then, is to make us question: What would have happened if everything, or even one tiny thing, had been different? Among the most effective techniques Dulude and Short use, as the only two actors ever on the stage, is a carefully choreographed motion in relation to each other, sometimes exactly repeating the same patterns and sometimes trading off so that each repeats the motions of the other. The subtlety of their interactions is so complete that the play has no opening or beginning in the conventional sense: The traditional briefing about where the fire exits are and so forth occurs when audience members are handed their ticket and enter the area of the stage, at which time the more observant will notice Dulude and Short moving in a seemingly haphazard way in the far reaches of a wonderfully creative set consisting of nothing more than banners hanging from the rafters and artwork on the floor. Watching carefully in the dim light, it becomes apparent that their motions are not haphazard at all but are a recurring dance of moving forward, stopping, partially reversing, and then moving forward again, slowly progressing closer and closer to the audience in a way reminiscent of Brownian motion. Perhaps aided by Maxwell’s demon, the action of the play spontaneously starts. In addition to the playful choreography, the deceptively bare set comes alive with projections, almost like an abstract planetarium, with scenes of star fields and astronomical objects such as nebulae projected onto the white banners. Director Aubrey Snowden told me when I asked that her intention was to evoke “the majesty of space,” and she does that with extraordinary effectiveness. Snowden credited the impressive set to a collaboration among set designer Max Ponticelli, projection designer Andy Russ and light designer Kelly Lipsey. The set is truly original and gives the show a depth and resonance that has to be seen in person to be appreciated. Constellations at Wilbury is an enjoyable, profound, thoughtful and intriguing exploration of, well, everything. The acting and directing are outstanding, enhanced by an excellent combination of set, projection and lighting. But don’t worry, if you made it this far into this review, you now know enough quantum physics to appreciate the play. Previous post: AltHealth: Can Alzheimer’s Disease Be Prevented?